Documentation updates for the September QuestionPoint release are now available. Links to the updated or added documentation and descriptions of the changes are available in the What's New area of the QuestionPoint Documentation page. [Updated page 2 bottom left and page 11 bottom to add a task to "Exclude transcripts of chat sessions with other libraries' patrons." This webinar, held on Sept. 19, 2007, explored how libraries can provide reference services to all users, including those using screen readers or other assistive technologies, with a focus on QuestionPoint's new lightweight patron chat ("Chat 2"). The program began with Catherine Durivage, Library Program Director of the Minnesota Braille and Talking Book Library, providing a general overview of the InfoEyes project, a virtual reference service for the visually impaired. Catherine was followed by Joe Thompson (Project Coordinator) and Julie Strange (Operations Supervisor) of Maryland AskUsNow! Joe provided an overview of the long search in Maryland for a truly accessible service. He reported that QuestionPoint's "Chat 2", released in June 2007, will likely enable Maryland to reach that goal. Julie showed screen shots of the patron interface and talked about Maryland's plans for implementing Chat 2 statewide. Our final speaker was Heather Muller, former coordinator of Washington's statewide virtual reference service. Heather provided feedback from visually impaired patrons who have used Chat 2 with screen readers, and she brought the session to a close with an inspiring message on equity of access for all users. Click View recording again, and select Microsoft Office Live Meeting Replay as the replay format. This recording is available in the LiveMeeting archive for 30-days after the broadcast. Tips: be sure you have a sound card, and set your screen resolution to 1024 x 768 for optimal viewing. Thanks for your participation in this discussion! A scheduled QuestionPoint maintenance installation is planned for this Sunday, September 23. The system will be brought down at 0700 GMT and will remain down for approximately 15 minutes. Please make sure to end any in-progress chat sessions prior to 0700 GMT to avoid sudden communication interruptions to your patrons. When service is restored, please check your “New” questions lists for any interrupted chat sessions or unanswered email questions. The information below describes the user-apparent changes you will see after the system is brought back up. We will post the expected down time in the Announcements area of the My QuestionPoint home page. Please check there for any last-minute changes. Please let us know if you have any questions. 1.1. Exclude transcripts of sessions with others’ patrons from your question lists. Institutions that participate in the QuestionPoint 24/7 Reference Cooperative are required to review transcripts of chat sessions with their patrons, to ensure that quality is being maintained within the cooperative. 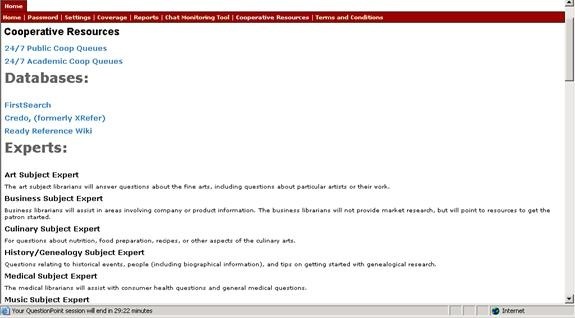 Many institutions choose to do this review using the Active Questions list in the Ask module, where they can close or forward transcripts as they review them. Since that list also contains transcripts of sessions the reviewing library had with other libraries’ patrons, the review process can be cumbersome as the reviewer picks her/his way through many transcripts s/he does not need to review. 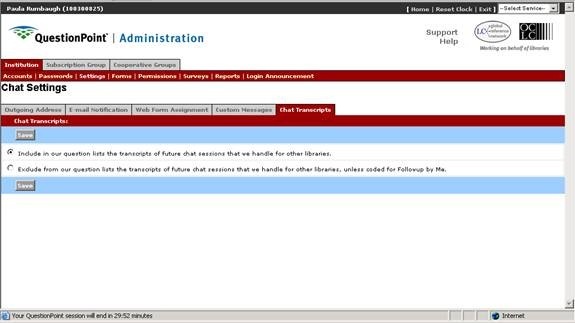 With the new feature, institution administrators can select a setting in the Administration module that will exclude transcripts with other libraries’ patrons from their Active Questions list. If this option is selected, only those transcripts with the library’s own patrons will display. The setting is at Administration/Institution/Settings/Chat Transcripts. 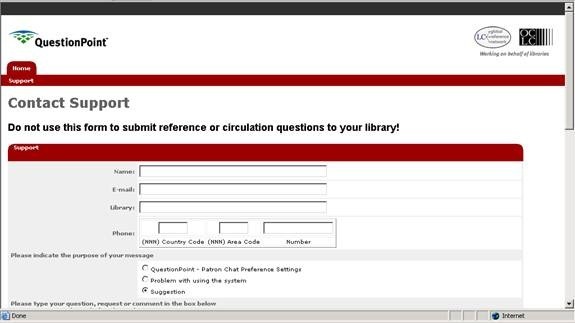 The Exclude feature is available to any library that uses Flash-based chat and picks up chat sessions for other libraries’ patrons. 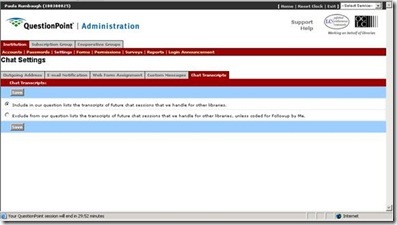 In order for the exclusion to work reliably, however, chat librarians must select a resolution code at the end of the chat session; accepting the default resolution code will not work. The default Exclude/Include setting includes transcripts with others’ patrons, as is the case today. If the administrator elects to exclude these transcripts, the change affects only transcripts from that point forward. The change is not retroactive. In the illustration below, the two transcripts circled in red would not appear in the Active Questions list if the Exclude setting had been selected. 1.2. Cooperative Resources available from the My QuestionPoint home page. 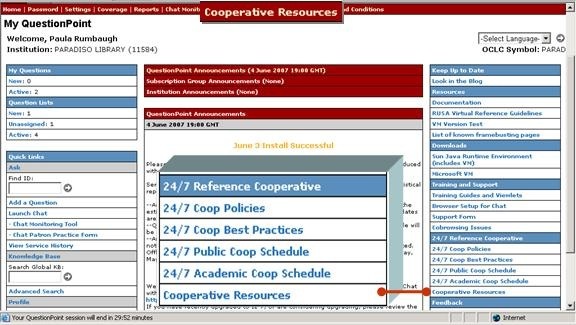 For 24/7 Reference Cooperative participants, the 24/7 Info components have been added to the My QuestionPoint home page, Cooperative Resources (top red bar and in the right-margin quick links, 5th section). 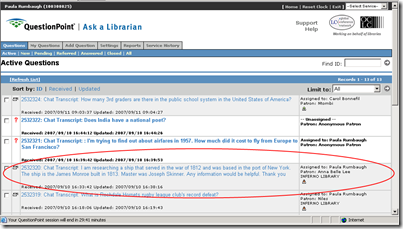 · A Ready Reference wiki, which was compiled by the QuestionPoint back-up librarians and provides quick, authoritative starting points that librarians can use during live chat sessions. 1.3. Notes in transcripts appear in a different color. Anyone using the Flash-based chat monitor will appreciate seeing notes appear in a different color (reddish brown) from the discussion text. 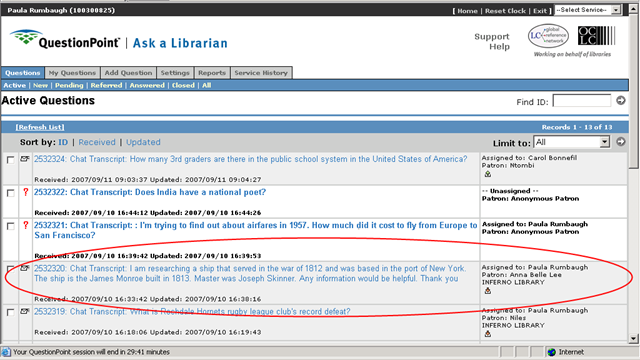 This enables you to see instantly what does and does not appear in the patron’s monitor and e-mailed transcript: anything in reddish brown will not appear for the patron; however, it will appear for librarians in the question history in the Ask module. 1.4. 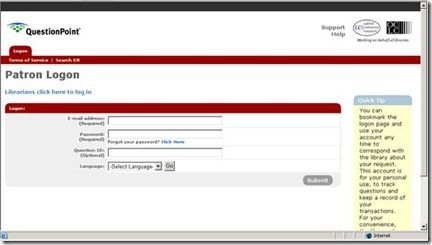 Patron Support Form available in patron interface. 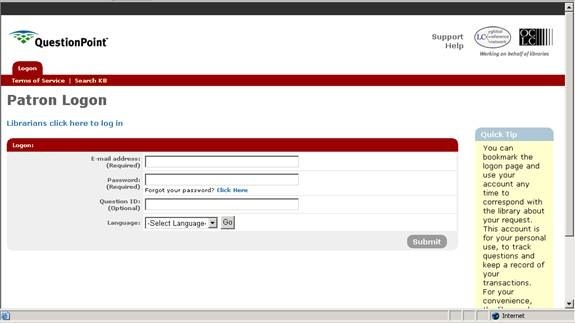 Now patrons can get help directly from the OCLC support desk (Customer Services Department) with a minimum delay. The new form is specifically for patrons to ask help and cautions them to not ask reference questions on this form. Policy Page searches now display results in alphabetical order regardless of upper- or lower-case letters. This search option is accessible from My QuestionPoint home page or via the Profile module, Search Profiles tab. Our four panelists will provide a general overview of virtual reference services to users of assistive technologies, as well as a general discussion of the new QuestionPoint lightweight chat – a new patron interface which expands the capacity of libraries to serve their community in a variety of environments, including users who rely on screen readers. Since the call for participants is for a limited time only--currently estimated to end in October--the nearer the beginning of the e-mail you place the message, the more likely it is to be seen. Or perhaps you can think of other ways to highlight it. We are seeking your help in recruiting participants for an important web survey. We need participants who are not librarians, library science students or faculty. We are looking for individuals who have chatted or IMed with a librarian as a user of a virtual reference service for our grant-funded research project, "Seeking Synchronicity: Evaluating Virtual Reference Services from User, Non-User, and Librarian Perspectives." The survey will take approximately 30 minutes and participants will be paid $25. We also may offer them the opportunity to take part in a live telephone interview for $30. This study will evaluate the sustainability and relevance of library virtual reference services. It is funded by a US federal grant from the Institute of Museum and Library Services, Rutgers University, and OCLC Online Computer Library Center, Inc. The principal investigators of the project are Marie L. Radford (Associate Professor, Rutgers University) and Lynn Silipigni Connaway (Consulting Research Scientist III, OCLC). 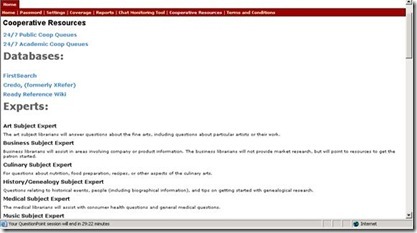 One way that may be possible for you to help is to include the following line in your closing script to users or as a line in the emailed transcript they receive following the session: "If you are interested in participating in a PAID research study about virtual reference similar to our 'insert service name', please email [email protected] for more information." Another way is for you to forward our email address to potential participants, [email protected], asking if they would be interested in participating in a PAID research study about chat reference services similar to your own. Please contact me via email if you have any questions. During the 2007 IFLA conference, QuestionPoint hosted a discussion on virtual reference around the world. Librarians from Australia, Croatia, France, Germany, South Africa, the United Kingdom and the United States attended the meeting, held on Wednesday August 22, 2 PM to 4 PM in Durban South Africa. We started the meeting with a brief introduction from each participant. Many of the meeting attendees represented libraries in South Africa, including public libraries in Cape Town and Johannesburg, as well as several university libraries: the University of South Africa (UNISA), University of Cape Town, and Stellenbosch University. Stellenbosch and UNISA both use QuestionPoint; Stellanbosch uses the knowledge base extensively. UNISA has over 200,000 students on 5 campuses and is part of GAELIC (Gauteng and Environs Library Consortium). Of the public libraries attending, Cape Town has 104 service points and the Johannesburg system has 47 branches. *The state library of Western Australia participates in Australia’s nationwide AskNow service, now in its 5th year. AskNow is experimenting with a nationwide Instant Messaging component to supplement their web-based service. *Participants from the Enquire service provided an update on this nationwide 24/7 chat service. Enquire originally consisted of public libraries in England but is now expanding to include libraries in Scotland. 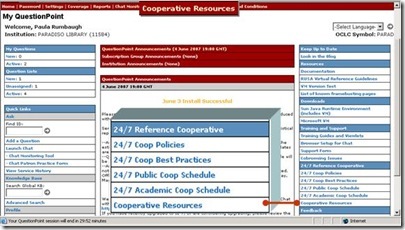 The Enquire service will be joining the 24/7 Reference Cooperative in 2008. *Berlin Central and Regional Library has created partnerships with libraries throughout the world, to provide multilingual reference services. Currently Berlin offers reference services in 21 languages, and more are on the way. This fall, Berlin is embarking on a new project: Chat for Children, with some partner libraries in Germany. *From the US, a member of the 24/7 Reference academic cooperative – from the University of Arkansas – spoke of their experiences in providing reference help for students from other universities. Several members of the Library of Congress also attended the meeting. If you attended the meeting, please feel free to add more information about your virtual reference service. All are welcome to add comments related to virtual reference cooperation, especially in an international context.